Cover image © Harper Collins. I’m definitely a fan of Agatha Christie. There’s something about her work that makes me think of Sunday afternoons and Christmas. 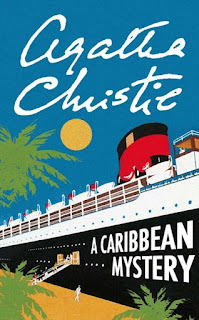 That said, I’m much more of a Poirot fan than I am of the Marple stories, but, being in the Caribbean, and needing a ‘small island’ mystery, I turned to A Caribbean Mystery (1964). To pass the time, as one could expect at an exclusive resort like the Golden Palm Hotel, gossip is an easy method. When retired Major Palgrave starts spinning one of his yarns about a murder, he stops abruptly, just as he is about to produce a photo of a murderer from his wallet to show Miss Marple. Needless to say, by the following morning, Major Palgrave is dead. The rumour doing the rounds at the hotel is that the amount of Planter’s Punch he'd drank, plus his high blood pressure, has been the final undoing of him. But did the Major ever actually say that he had problems with his blood pressure to anyone? Miss Marple’s interest is piqued and she is skeptical of the cause of death being simply natural causes. There are the usual cast of eccentric characters to both move the plot along and cause distractions as the mystery unravels: the young proprietors of the hotel, Tim and Molly Kendal; a strange quartet of nature lovers, Colonel and Mrs Hillingdon, and Mr Greg and Mrs ‘Lucky’ Dyson; Canon Prescott and his sister; the mega-rich Mr Rafiel, his assistant Esther Walters and masseur Jackson; and a Venezuelan family, the de Caspearos. As is often the case with Agatha Christie, and indeed many a crime novel, the first death isn’t the last. It isn’t long until the “tall and buoyant” Victoria Johnson, a local woman who works at the hotel, thinks that something is awry with the murder of Major Palgrave, noticing that another guest’s medication was left at the scene of the murder; she doesn’t last much longer. A good Sunday read and you don't have to be in the Caribbean to enjoy it. In many ways, the descriptions of the “West Indian” girls with “such lovely teeth and so happy and smiling” may make post-colonial readers cringe a great deal, especially when coupled to the frankly bizarre comment that it is “a pity they were so averse to getting married.” Indeed, the unfortunate Victoria is depicted as living as married, but not actually married. Furthermore, the representation of a Caribbean island, where rich white tourists use the region as their playground, may not seem too far from today’s realities – something that Simon Reeve's recent TV series may have helped to partially dispel. Overall, the book is a good read as, in true Christie fashion, the motive and the culprit for the murder are kept well-concealed until the all important Agatha Christie Moment at the end. Read it on a Sunday in November, or on holiday on a hot island, and you'll not be disappointed.